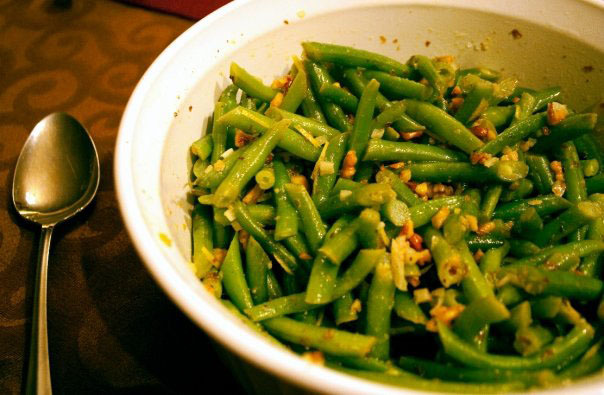 With Thanksgiving quickly approaching, I wanted to give you a few vegetable side dishes. One green bean, one corn, and one sweet potato. Enjoy! Remove peel from lemon with vegetable peeler and cut into very fine strips. Cut lemon in half. Squeeze enough juice to measure 2 tablespoons; transfer to small bowl. Whisk in mustard, then oil and shallot. Season with salt and pepper. Cook green beans in pot of boiling salted water until crisp-tender, 5 to 6 minutes. Drain; pat dry. Combine beans, walnuts, and lemon peel strands in large bowl. Add dressing; toss to coat. Season salad to taste with salt and pepper and serve. They are delicious warm or at room temperature! Preheat oven to 425 degrees. Melt 2 Tb. butter in heavy large skillet over medium-low heat. Add onions and celery; sprinkle with 1/2 teaspoon coarse salt. Sauté until tender but not brown, 10 to 12 minutes. Scrape mixture into bowl. Whisk egg yolks in large bowl 2 minutes. 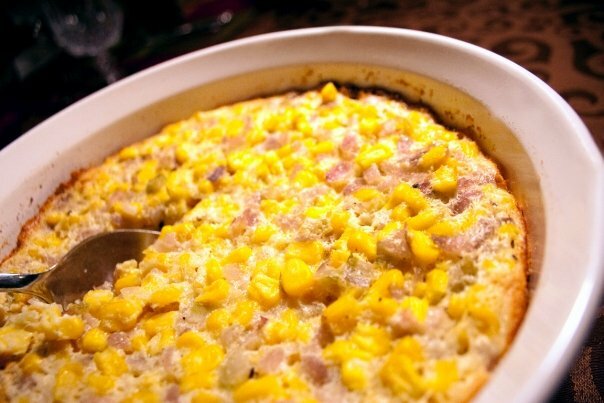 Stir in corn, onion mixture, sour cream, 1/8 teaspoon pepper, and remaining 2 teaspoons coarse salt. Whisk egg whites in medium bowl until stiff but not dry; fold into corn batter in 2 additions. Place remaining 2 tablespoons butter in 10- to 12-cup cast-iron skillet or baking dish. Transfer to oven and heat until butter begins to brown, about 4 minutes. Brush butter over inside of skillet. Add pudding. Bake pudding 15 minutes at 425 degrees. Reduce oven temperature to 350°F. Bake pudding until set and golden, about 30 minutes longer. Let stand 5 to 10 minutes before serving. This corn was amazing! I loved it! Combine brown sugar, oatmeal, flour, and cinnamon in a bowl. 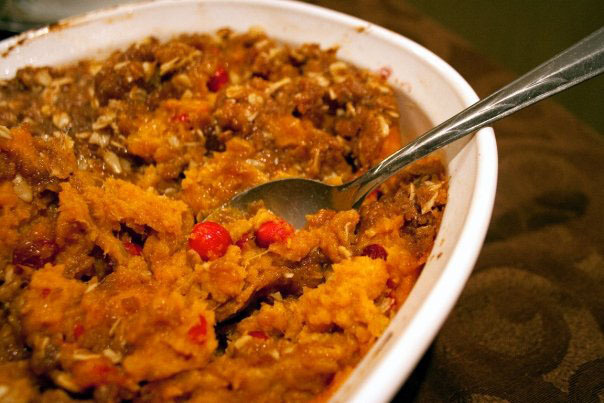 In a 2.5 quart casserole dish, combine sweet potatoes and cranberries with half of the sugar mixture. Combine the rest of the sugar mixture with the melted butter and put it on top of the sweet potato mixture. Bake at 350 degrees for 30 minutes or until bubbly. You can prepare this a day ahead- cover and refrigerate it before baking but you may want to wait to put the topping on until you are ready to put it in the oven. This is sweet, tart, and perfect! These sound like some dishes that should be showing up on our Thanksgiving table!